Clifford Chance (CC), Kenyan firm Anjarwalla & Khanna and Standard Chartered’s in-house team topped the bill at the African Legal Awards 2016. Overall, 26 awards were given out to celebrate the achievements of African in-house and private practice lawyers. The judging panel was chaired by CCASA CEO Alison Lee and also included Talenta Chavalala, a senior legal adviser for the Development Bank of Southern Africa, and Bill Skirving, group legal adviser of the Hannover Reinsurance Group of Africa. 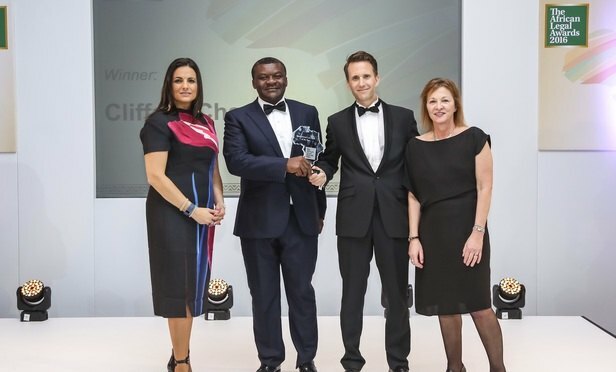 CC saw off competition from firms such as Baker & McKenzie, Norton Rose Fulbright and Herbert Smith Freehills to win the prestigious International Law firm of the Year award. Anjarwalla & Khanna repeated its success from last year to once again win the award for African Law Firm of the Year – Large Firm, while Standard Chartered collected an award for Legal Department of the Year – Large Team category. South African origin firms ENSafrica, Bowmans and Linklaters ally Webber Wentzel all had successful nights, each scoring a hat-trick of awards. International firms that were successful on the night include White & Case, Baker & McKenzie and DLA Piper. The latter firm, which only launched its first South African office in Johannesburg last year, won the award for Network of the Year, for its DLA Africa offering. The African in-house community were also well represented at the event, with major winners including Tammi McMahon-Panther of Procter & Gamble, who was named Junior Corporate Counsel of the Year, and Josie Lyon of the Protea Hotel Group, who won the General Counsel of the Year award. The night culminated with the CCASA Achievement Award, which went to Thuli Madonsela, an advocate of the High Court of South Africa, for her work in the human rights and constitutional law sphere.